[Image: Giovanni Fontana's 15th-century "castle of shadows," from a paper by Philippe Codognet]. 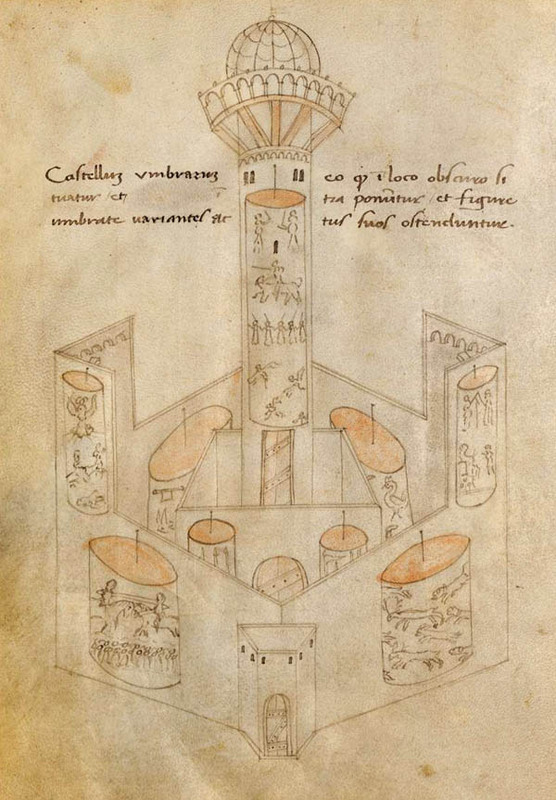 In a book published nearly 600 years ago, in the year 1420, Venetian engineer Giovanni Fontana proposed a mechanical construction called the Castellum Umbrarum, or "castle of shadows." Philippe Codognet describes the 15th-century machine as "a room with walls made of folded translucent parchments lighted from behind, creating therefore an environment of moving images. Fontana also designed some kind of magic lantern to project on walls life-size images of devils or beasts." Codognet goes on to suggest that the device is an early ancestor of today's CAVE systems, or virtual reality rooms—an immersive, candlelit cinema of moving screens and flickering images.